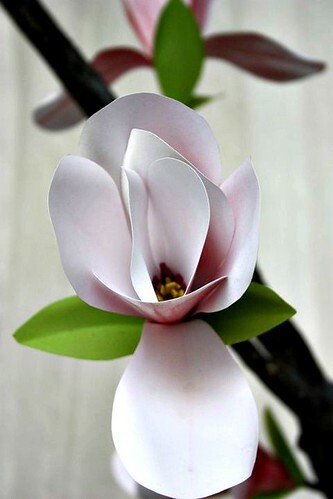 A beautifully realistic magnolia blossom - one of many, actually - that Karin created for a wedding reception. She also made table centerpieces, place cards, napkin rings, and a colorful chandelier and archway, all with paper flowers - see them on Facebook. I hope you have some nice plans for the weekend ahead - enjoy it! oh ann, this is gorgeous! and so well timed. the tulip magnolia tree in my yard is in full bloom, but one gust of wind and the petals will fall. it's my favourite thing to see at this time of year, the colours are so subtle and karin has captured them perfectly. Hi Ana, I know just what you mean... magnolia blossoms never seem to last long enough. Magnolias are a favorite of mine. Love them in paper! I want to touch that flower so bad! It looks so soft!! Amazing!!! gaah!!! the chandelier!!!! i love it! The flower looks so real and so very delicate. What beautiful flowers! Paper folded flowers are just about my favorite!